Remembering Cardiff University alumni, staff and friends. Raised in Saltash, Cornwall, Dean began his studies at Cardiff Business School in 2004. He developed a close circle of friends while living in Talybont North and through his course. After graduating he remained in Cardiff to embark on a successful career in accountancy. During this time he met fellow Cardiff graduate Katie (née Punter) (BScEcon 2010). They married and moved to Exeter to start a family, with daughter Evie arriving last year. 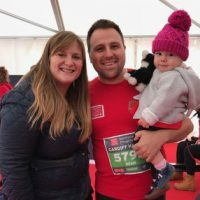 Dean passed away after completing the 2018 Cardiff University/Cardiff Half Marathon. Friends and family remember him for his “wonderfully weird, joyous approach to life” and as a devoted and “amazing father and husband”. Malcolm Anderson arrived in Cardiff as a teenager to study at the Cardiff Business School, and stayed. During his 30-year career in the Business School following his studies, he was a prolific researcher and a dedicated, popular teacher. His passion for education – and Swansea City FC – was felt keenly by colleagues and students. He leaves a wife and three daughters, to whom he was devoted. Born in Cape Town, chemist, entrepreneur and philanthropist Rashid Domingo came to call Wales home. In 1971, he founded Biozyme (one of the world’s largest enzyme producers for diagnostic clinicians) and remained an enthusiastic proponent of education and its power to transform lives. A strong believer in “giving back”, Mr Domingo used his success to support others. He gave generously to Cardiff University to create a bursary fund for students in financial hardship.